I read an article online today promising tonight, Winter Solstice 2014, is the longest night ever in the history of our planet. Because the earth always moving from the sun due to IMAGINE SCIENCTIFICAL-TYPE STATEMENTS HERE ‘CAUSE I WAS TOO LAZY TO COPY THEM, which therefore means that today is roughly two seconds longer than last year. Tonight is the longest night we’ve ever experienced. It would be one thing if this were the first, shocking instance. But on the night before I was born in 1967, mom could see the McDonalds burning down across the street. She thought, ‘What kind of world?’ These were the Detroit Race Riots. Followed by a lot of incidents between then and now. So, you know, this isn’t new news. Sometimes our world feel like the longest night. The darkest night. Will it ever get better? For me, the holidays are a combination of my best memories and a few of my least-favorite. Luckily, awesomeness outshines the bad, but that does not mean I feel both freely. Tired and needing a break, this year, I opted out of Christmas. Other times, when I’ve missed Christmas at home, they were exceptions and had good reasons. I’ve had a lot more years in my hometown than away. One year, Ann and I drove to Mississippi to do cleanup after Hurricane Katrina. An intense experience grieving and loving strangers. My first Christmas away from my family. When I called home on Christmas Eve, they passed the phone around and I sat in the back seat of my car and imagined the smells in mom’s house. Fresh gingerbread. Roast beef. Last year, Ann and I drove to Galveston, Texas and treated ourselves to a vacation. Another first. I’d never spent a holiday pampering myself with my best friend in a gorgeous location. The experience was shocking to me. Liberating and naughty. This year, I’m skipping the holiday claiming exhaustion and no vacation days. Both are true. And though I’ve seen family a lot this past year including Thanksgiving weekend, this is a lost opportunity to see family. No decorating gingerbread cookies with siblings on Christmas Eve morning. Beautiful friends in the twin cities have offered me invites. And yet, I want to see who I am without the holiday. I want to see who shows up. And on the plus side, I didn’t have to put up outside lights this year. Although I do like looking at all the lights. I will admit to my well-orchestrated neighbors, I’m impressed. Sorry for not doing my part this year, but good job. Obviously, I’ve been a little torn about the holidays. Happy to have zero shopping, and no decorating responsibilities. But sad, because it’s fun to get caught up in the excitement of gift giving and wrapping, and seeing surprise on a loved one’s face. There’s some real beauty in this season. Friday night I was chatting with my friend Joel, and explaining my missing out. Joel and I talked about a number of things, previous holiday experiences, the good and the bad. At one point, he sounded distracted I asked him what he was doing. He explained that he was untangling his lights. Just asking that made me miss all my favorite Christmas ornaments and remembering I would not see them for at least another year. I was feeling a little contrary, I guess. Maybe I was looking for something to celebrate. I had been dwelling on the darkness all around us. Institutionalized racism. Revenge killings. So many wrongs still need to be righted. We talked about it and though I have plenty of friends who celebrate Solstice, I had never really given it much thought and I now found myself intrigued, the idea of celebrating nothing but the light. The light comes back. Weakly at first, but it’s coming back. Though January and February must unfurl with blizzards for us to slog through, still the light grows stronger. 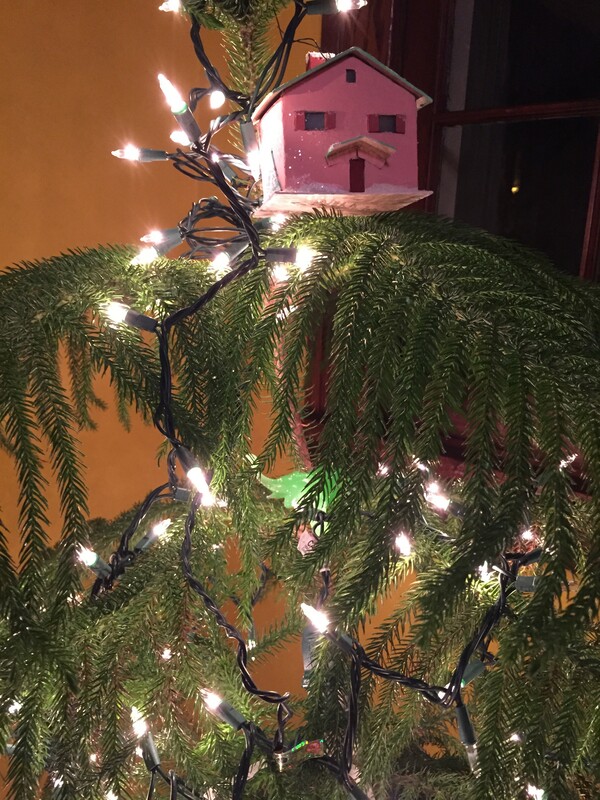 By the time we hung up, I had found the clear lights in my basement storage and selected which potted plant to decorate, my Norfolk Pine, a former Christmas tree. I realized what I had been missing by not participating in Christmas this year. The ability to celebrate with others. To just feel celebratory. Maybe this week is the anniversary of Jesus’ birth. Maybe it’s a marketing campaign masterminded by a hungry world religion. Who cares? Can we just say, Merry Christmas and let the words mean, ‘I celebrate you in your language.’ Happy Chanukah and Blessed Be if that’s what they want to hear. If we can’t celebrate the ideological differences or embrace each other’s life experiences, maybe we can still find surprising common ground. Without agreeing on the target, we can celebrate being people who love to celebrate. I awoke this morning excited to celebrate my non-celebratory year. I created a list of 34 things I’d like done this week. House projects mostly. Cupboards and storage things cleaned up. Piles sorted. I am getting rid of 50 items from this house. I make tic marks on the massive chore sheet. This is my celebration, and I gotta tell ya, I like making lists and checking things off. I’m also seeing a few friends, so do not fret over me. I’m not completely isolated. While scrubbing old water stains on the basement floor this afternoon, I spied the tub of Christmas decorations and decided to add one of my favorite ornaments, a cardboard bungalow home almost identical mine, intricately carved and hand-painted, crafted by an ex-boyfriend from my youth. Also, a jade elephant from Ireland made the tree, the last elephant from Ireland, sent to me by ridiculous, wonderful people. New friends. I would never know them except for the internet. Had a little shopping to do so I ended up going to Target. I chatted happily with the checkout lady and I was surprised she had so much good cheer, working in such a demanding environment, hour after hour. She celebrated me. I love little cocktail wieners at holiday parties. And, the taste of these guys! The rich flavor was tangy-grilled without tons of barbeque sauce (which I also like). Surprisingly perfect. I chatted with him about his hot dogs and then eagerly bought a package. He said thank you to me, and he was sincere. A few aisles later, I was humming the Christmas carols, vaguely echoing the music swimming above me and feeling very happy about celebrating and not-celebrating. I am someone who welcomes the light. At the end of the aisle, I ran into a woman who only had a few things in her basket which included two packages of the amazing cocktail wieners. We chatted about hot dogs and holiday parties for another few sentences and went on our way. She will never know me, hell, she doesn’t even remember me at this point. But we were light to each other, for a split second. She might stand for everything I detest. I might be her worst liberal nightmare. But we chose to be light. Tonight, I welcome the longest night. C’mon, darkness, settle in. Depress us. Convince us there is no hope for morning. We will end you, longest night. We end you with a festival of lights. Kwanzaa. Chanukah. Christmas. And those who look at anyone in that pile and say, “You people are crazy.” We celebrate them, too. People who find cocktail wieners disgusting and people like me. When we celebrate each other, we cannot be stopped. This entry was posted on Sunday, December 21st, 2014 at 7:35 pm	and is filed under Gratitude. You can follow any responses to this entry through the RSS 2.0 feed. You can leave a response, or trackback from your own site. I loved your post, Edmond. I’m not much for Christmas. I’ve got nothing against it, and I do enjoy spending time with family and loved ones but I consistently fail to get as excited or exercised about it as those around me. As a result I often feel like the odd duck out, especially here in Ireland where Christmas appears to be THE event of the year. I do always look forward to December 21st. While it may be another month or more before I’ll actually notice the days have gotten longer, just the thought that the tide has turned is enough to cheer me up. Thank you for mentioning the mini wieners (or knakworstjes as we call them in the Netherlands). I haven’t seen or eaten them since we moved to Ireland and didn’t, until I read your post, realise how nice it would be to get my hands on some. Over the next few days I’ll enjoy spending time with my daughter and husband while contemplating how lucky I’ve been over the past year. I’ve had the good fortune to meet some wonderful people online, one or two of whom have captured a place in my heart. I’m grateful you’ve found your place there.It’s now hard to imagine my life without the smiles, laughs, and opportunities to look at things from a different angle, you’ve provided me with. Thank you. Great post, Edmond. We’ve been working toward a less stressful holiday for years and we use it to celebrate family. Were those the cranberry pork cocktail weiners? Cuz I bought two packs of them also! Seems to mesh with your musings rather well. Thank you, Sara! Winter solstice joy to you! Amen to that – may it shine from my heart to the world! Lynn, I do not know where those mysterious wieners come from. I only know I’m not sharing mine with you. Sorry. And happy holidays. Thank you for the big holiday blessing, Helena! I totally understand that feeling of looking around and being the least ‘excited.’ But the part I do love is hanging out with my family. And that’s the holiday for me. And now…with online friends, there’s a bigger family! Cheers to you, new friend. Cheers. What a beautiful event, Dermot. When I was in Italy, I was completely flummoxed by the age of things. Yes, I knew there would be old buildings and ruins, etc. No surprise there. But I did not count on my awe – my sheer awe – at standing near them and contemplating the thousands and thousands of lives who had seen and touched these stones, this corner, this particular arch….it overwhelmed me. I get shivers when you describe people gathering around a 5,000 year old building. That doesn’t even compute but it makes me intensely jealous to know what it’s like to stand with those people to welcome the light. Wow. I love you too, Jaycee. Awww…I came back to make a snarky comment about where Marleen could “get her hands on” a mini weiner, but then you when and got me all teary.